Brigham Young was a rough-hewn craftsman from New York whose impoverished and obscure life was electrified by the Mormon faith. He trudged around the United States and England to gain converts for Mormonism, spoke in spiritual tongues, married more than fifty women, and eventually transformed a barren desert into his vision of the Kingdom of God. While previous accounts of his life have been distorted by hagiography or polemical expose, John Turner provides a fully realized portrait of a colossal figure in American religion, politics, and westward expansion.After the 1844 murder of Mormon founder Joseph Smith, Young gathered those Latter-day Saints who would follow him and led them over the Rocky Mountains. In Utah, he styled himself after the patriarchs, judges, and prophets of ancient Israel. As charismatic as he was autocratic, he was viewed by his followers as an indispensable protector and by his opponents as a theocratic, treasonous heretic.Under his fiery tutelage, the Church of Jesus Christ of Latter-day Saints defended plural marriage, restricted the place of African Americans within the church, fought the U.S. Army in 1857, and obstructed federal efforts to prosecute perpetrators of the Mountain Meadows Massacre. At the same time, Young's tenacity and faith brought tens of thousands of Mormons to the American West, imbued their everyday lives with sacred purpose, and sustained his church against adversity. Turner reveals the complexity of this spiritual prophet, whose commitment made a deep imprint on his church and the American Mountain West. It's hard to believe John Turner isn't a Mormon. He understands the history and doctrine of the LDS church better than most members do (and I include myself). The book is well written and the narrator Stephen Hoye dials it in perfectly. 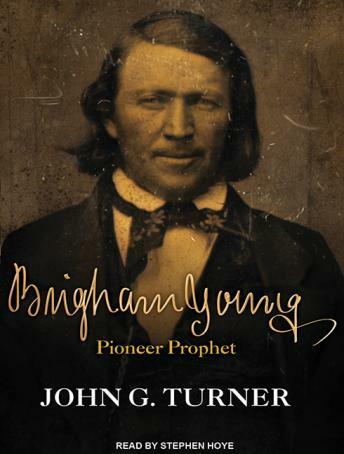 Brigham Young: Pioneer Prophet was a great introduction to Mr.Turner's work. I'm now reading The Mormon Jesus: A Biography and hope that turns into an audiobook too.